"Tom Noddy introduced America and the world to Bubble Magic via television in the early 80's. Before that, he spent a decade inventing and developing this astounding art." 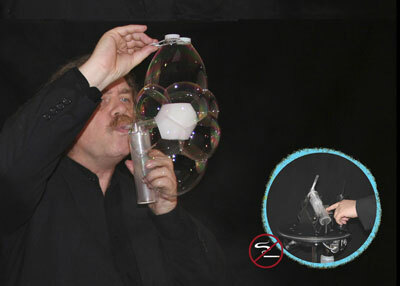 Tom Noddy's Bubble Magic is, of course, a hit with kids but when presented to adult audiences ... well, this is what the New York Times said recently: “The Bubble Guy, Tom Noddy, made his jaded adult audience literally gasp with beautiful constructions made entirely of soap bubbles." Before first bringing his performance to television in the early 80s, Tom Noddy spent over a decade developing a new kind of performance piece. Sitting alone with dime store bubble solution, a childlike sense of wonder and an adult sense of humor he brought a new thing into being: Bubble Magic. After three appearances on America's Tonight Show, Tom was featured on the ‘Best of the Year’ Tonight Show segment. 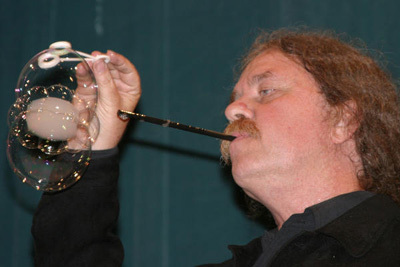 In his 30-plus year career as America’s Bubble Guy, he has appeared numerous times on prime time, daytime and late night television shows as well as nightclubs and universities. Tom’s work has been presented to 900 mathematicians at the International Congress of Mathematics in Berlin, Germany. He's been the featured performer for science centers' Bubble Festivals attracting up to 17,000 people in a single weekend. He is as comfortable performing for pre-schoolers as he is when entertaining audiences in the Varieté theatres of Germany, the Paris Opera, Le Casino nightclub in Monte Carlo, corporate parties, trade shows, or television programs in over 50 countries.Tom has taken his uniquely warm charm and intellectual interest in soap bubbles to audiences around the world. The bubbles are truly exquisite and Tom’s lively humor and engaging sense of fun leave his audiences both delighted and intrigued. Describing what he does, Tom tells about a few of his figures: "Bubbles inside of bubbles, smoke bubbles, clear bubbles, clear bubbles inside of smoke bubbles, smoke bubbles inside of clear bubbles, inside out bubbles, yin yang bubbles, caterpillar bubbles, love bubbles and a bubble cube. The yin yang bubble is a double bubble; a smoke bubble inside of a clear bubble and a clear bubble inside of a smoke bubble, it's my most difficult trick ... to say." "Enjoy my website and please make an effort to see the real thing some day. Don't worry, even I can't blow an ugly bubble." New! Bubble Magic with fog, not smoke!